The ease of operation and attention to the human interface that you have come to expect from NCE systems with the power to run large pikes, including heavy-duty garden layouts, comes standard on these systems. They can have enough cabs on them to run the largest of layouts. UseRJ cablesto connect your fascia panels to the set. These sets use aCR2032 batteryto retain the data when the set is off. MR. DCC recommends annual replacement of the battery. See RELATED PRODUCTS, below. If you are in the smaller scales (up through S or even smaller O scale), the 5 amp Power Pro system is just the ticket for your layout. The power transformer recommended for 115 volt mains is the P515 – see RELATED PRODUCTS, below. 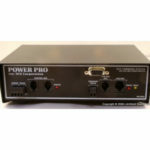 The power hungry G scale operator will appreciate the robust 10 amp Powerhouse Pro system. All the features that make NCE so fun, with enough power to pull the grade! This is an exceptionally powerful system. Please do not use it on smaller scales, even with circuit breakers – severe damage can result! The power transformer recommended for 115 volt mains is the PS-1812-AC – see RELATED PRODUCTS, below. 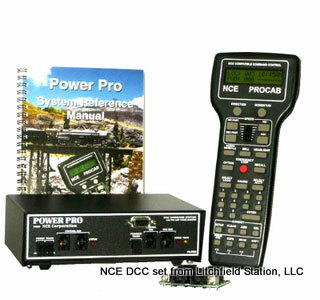 Most G scale power packs do NOT provide power clean enough to run this sophisticated piece of electronics. If you already have a PowerCab and want to upgrade to the ultimate NCE set, select the SYSTEM BOX only. 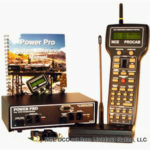 You will only spend a few dollars more than the 5 amp system, but you pick up the ability to use your PowerCab on the workbench, programming sound decoders and testing locomotive current. You can go cordless with the radio option, either when you purchase the original set, or in the future. Radio only sold in the USA, Canada and Australia. Litchfield Station is authorized to upgrade your non-radio cabs to radio, too! RC including NiMH batteries allows you to automatically charge your batteries when plugged into a live 524-Utp. Utps may also be powered by a PS112-1/8 and left on overnight to charge your cabs. We are on Mountain STANDARD Time (UTC/GMT -7 hours). We don’t change to daylight time – we don’t need more afternoon in the summer!